UEFA president Aleksander Ceferin talks during a press conference following a meeting of the UEFA Executive Committee in Cardiff, south Wales, on June 1, 2017. GENEVA - UEFA president Aleksander Ceferin has called for greater support from Europe's political leaders to help introduce measures to regulate the transfer market on the continent. "I have heard some very prominent politicians, such as the German Chancellor Angela Merkel just a few days ago, condemning financial developments in football and calling for greater sporting balance," Ceferin said in a speech to open the UEFA Congress in Geneva on Wednesday. "To all the European politicians, let me say that we cannot agree more, but I cannot say that you have done much to help us set things straight so far. "We are open to any and all reforms that would serve the good of the game. We are imaginative and we are committed, and we are just waiting for the green light from those who... have yet to enable us to put it right." Hoping to be elected for a fourth term in legislative elections this weekend, Merkel recently criticised French giants Paris Saint-Germain's spending in the summer transfer window as they committed the two biggest fees in history to sign Neymar from Barcelona for 222 million euros ($264m) and Kylian Mbappe from Monaco for 180 million euros. "Such sums are comprehensible to no one. UEFA and FIFA should readjust the rules on player transfers to ensure greater balance. Otherwise, the transfer fees threaten to rise further," Merkel said. UEFA earlier this month said they had opened an investigation into whether PSG had broken their rules on Financial Fair Play which are designed to stop clubs spending more than they earn. Europe's top clubs spent record sums in the transfer window that closed at the end of August, with English Premier League sides -- fuelled by enormous income from television rights deals -- splashing out £1.4 billion ($1.8 billion) in total. Stating his confidence that the situation will soon change, Ceferin added: "If European and national legislation were to allow it, we could envisage with more guarantees, and greater certitude, a whole arsenal of concrete measures to make the game fairer and better regulated, and improve its ethics and solidarity." Among the measures Ceferin floated to stop the chasm between the continent's richest clubs and the rest from further widening are salary caps, luxury taxes, squad limits and limits on player loans. 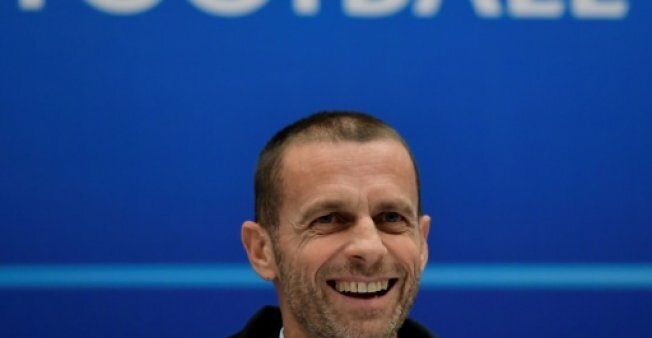 UEFA president Aleksander Ceferin has called for greater support from Europe's political leaders to help introduce measures to regulate the transfer market on the continent.